Is Ikea a pioneer in ecologically sustainable business practices, or just another corporation capitalizing on a fad? Their infamous flat pack approach has to cut down on carbon emissions besides just passing the savings onto you. Their bike trailer movement in Scandanavia is excellent, and they were one of the first large companies to say no to plastic bags. And in a few weeks, they're bring solar powered lighting to the masses. No more big boxes atop your roof...from now on, you can go green Mediterranean -style. 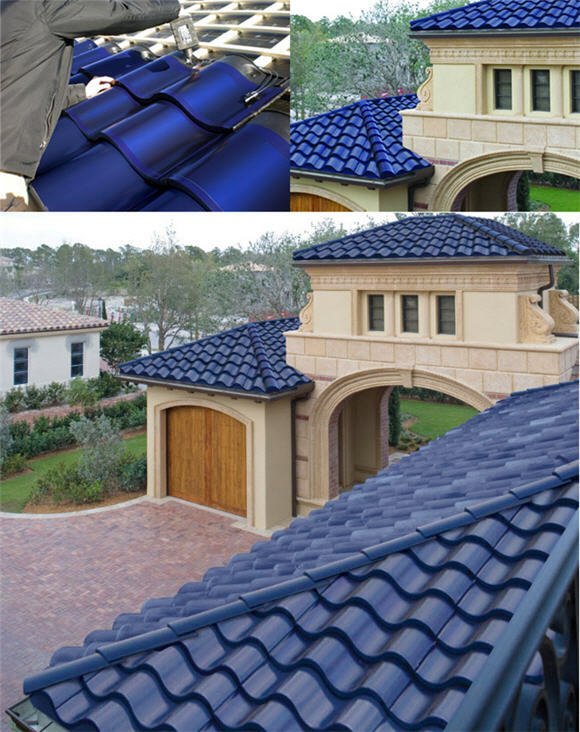 Solé Power Tiles allow homeowners to make eco-friendly choices without having to sacrifice style...if you want a blue mission roof, that is. Tiny and off the grid, could there be anything better? This 100 square foot home is part of the Human Landscape exhibit currently underway in City Hall Park in Burlington, Vermont, which runs until October 24, 2009. "This Solarjo Power Purse packs more than just good looks. Appearing at first like any designer handbag, this classy clutch is studded with enough solar cells to charge a cell phone battery in just two hours....The purse has a battery tucked away inside its lining with an attached USB cable that can be used to charge just about any device." For the image-filled tutorial, visit Not Martha. Via. If you have a garden shed or workshop that is lacking in illumination, you might want to consider the ‘Light My Shed’ solar shed light. No fancy wiring required, just mount the solar panel to the outside of your shed and the accompanying fluorescent light–NOT LED–inside the shed. Available through BackyardCity.com, the ‘Light My Shed’ will set you back about 80 bucks. Just in time to light up your warm summer nights is the solar powered umbrella. Its solar panel, which screws to the finial, powers 18 white LED lights that are fixed to the ribs of the umbrella as well as to a center hub of 8 additional LED’s. The panel charges in direct sunlight, and a full charge will provide 6 to 8 hours of light. The solar powered umbrella is available at Lowes for a very reasonable $98.83.